To answer the question of how a different perspective leads to a creative solution, we need to understand a little neuropsychology and what happens in the brain when you are solving a problem. Oscar Pistorius is an inspiration to all of us | wrapupp. Thanks to my friend Mona, I was reminded this morning that today was National Fried Chicken Day. Honestly, I was curious to its origin, and found that no entries for Fried Chicken Day exists in Wikipedia. (After all, if it’s not in Wikipedia, it doesn’t exist, right?) Suspicious, indeed… or, perhaps, a conspiracy? Regardless, after seeing Mona’s post, images of steaming hot fried crispiness overwhelmed me for a fleeting moment, and I felt moved to at least pick out a few of my favorite places in San Francisco for variations of fried chicken. Some may consider Capital a hole-in-a-wall joint, but it’s a really just a normal mom-n-pop cash-only Chinese restaurant. 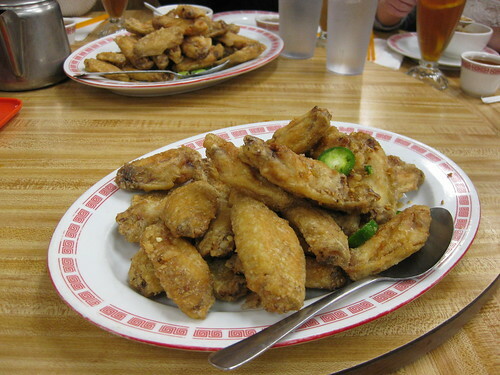 But while they cover all the basic Chinese rice/noodle/family-style dishes, the fried chicken wings in the appetizer section is a mouth watering find. If you crave a fried salt and pepper style crunch, this is the place. There’s a joke in a yelp entry that the chicken wings must be laced with crack. Many a days where I have been completely satisfied with a few orders of chicken wings and a bowl of rice (well, two or three bowls, but who’s counting?). 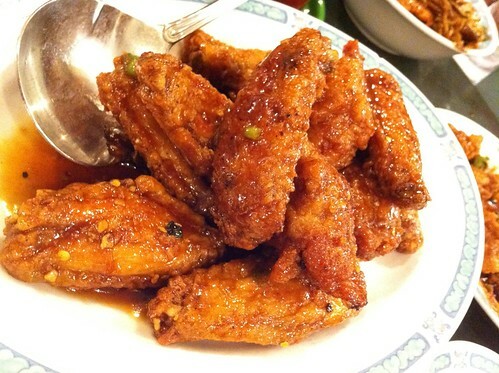 The San Tung Chicken wings are the sweet glazed Ying to Capital Chicken’s salty Yang. Their wings are so flavorful, that after the first bite, you end up at another level of carnal after each wing you finished, by the time you’re done, you’re part of an Asian version of Zombieland or have been cursed as an animagus of the Sunset. My take is that the honey glazed sauce seems to have the same consistency as blood, and starts getting messier after the first wing. You want to wipe you’re hands, but you’d rather have another wing, so you end up giving up being nice & clean and forgo all civil etiquette. It takes finger-lickin’ to another level. One tip: I always need to remind myself that they are closed on Wednesdays. I think they chose that day because they know that’s the day that people are most likely in the mood for those addictive wings. Also be prepared for longs waits during the dinner hours. Even though I’m half-Korean, I’ll always forget the name of this restaurant. But I’ll never forget the OMG chicken… And compared to the other previous picks – this isn’t just wings, but this here’s the real deal, the whole enchilada (mmm, enchiladas…). Anyway, this fried chicken’s power comes from the juicy steam-tender flavor hidden within the crispy cover. You’ll appreciate all the different pieces of the chicken with this dish. You’ll find yourself constantly picking at it with your sensitive fingers because the pieces are so hot from being immediately served from the fryer, but you can’t stop because it’s sooo good once it hits your lips! The cousin of San Tung in SOMA. It’s not as good as San Tung, but it’s quite close. For the token traditional style (non-Asian) fried chicken – the first thing that comes to mind. Juicy. Held in someone’s garage in the foggy netherworld of the Sunset district, their fried chicken and spicy chicken wings are complementary dishes to all the fruity soju drinks. Known for their karaoke rooms and their corn and cheese, it’s their spicy Fire Chicken which goes great with yogurt soju. Unfortunately, I haven’t found a good fried chicken place in Japan, which I travel frequently, but that’s because I’m usually preoccupied with other things while I’m there. I’ll make sure to have a follow up, and I’m sure I’ll find something that matches up to the top ones I shared above. How Music Travels: The Evolution of Western Dance Music – information aesthetics. Infographic Of The Day: The Biggest Cliches Of Web Infographics | Co. Design.